Have I mentioned that I like corvids? Maybe once or twice? This winter I have been seeing a lot of crows around where I live. This was not the case several years ago when the West Nile virus arrived in the Chicago area. The neighborhood where I lived at the time was one of the first hit hard. I would walk the dog and I would see dazed crows, teetering on low branches, or stumbling over the ground. They were literally falling out of the trees. 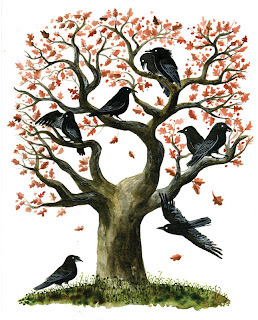 Even if you dislike crows, you would have agreed that it was a sad sight. For a couple of years, the skies were notedly quiet. They have bounced back a bit, as evidenced by the cackling surrounding my house, and by the feathery, black silhouettes in the naked, wintery trees. American Crows, Corvus brachyrhynchos, are familiar sights in many urban areas. In fact, they are more common now than when the first European settlers arrived, due to habitat changes. They tend to roost communally, and sometimes in the same roost year after year. They tend to be less social in the breeding season. Some populations of crows will breed cooperatively, with the parents often being assisted by an auxiliary (main offspring from the previous season). The current issue of National Geographic has a article on animal intelligence. One of the animals showcased is a very smart New Caledonian crow, Uek, that has exhibited problem solving, and tool making/using behavior. So now that is no longer the exclusive domain of mammals, we're just lucky they don't evolve opposable thumbs.